When you need to get away and experience something new, find your way to Irving. Nestled in the heart of the Dallas-Fort Worth Metroplex, Irving is a dynamic and diverse destination all its own. Spend the night tapping your toes to the tunes of a world-renowned musician at one of the best amphitheaters in Texas. Ride on a gondola like the kind you’d see in Italy. Indulge in cuisine from around the globe. There are more than enough things to see and do in Irving to fill up a weekend getaway, and you don’t have to go far to enjoy it all. Here are just a few of the ways you can have the ultimate quick trip to Irving, and you can go here to learn more. 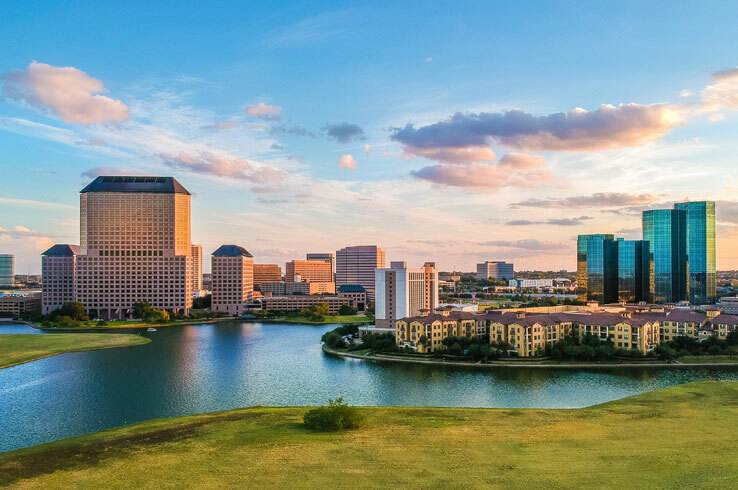 Tour Texas Tip: Irving is home to hotels ranging from affordable to luxurious, including the Four Seasons Resort and Club Dallas at Las Colinas and the Omni Mandalay Hotel at Las Colinas. Check out all the options here. With its world-class stages and abundance of bars where the tunes ring out all night long, Irving is the place to go for an epic evening full of live music. See famous performers from around the globe at The Pavilion at the Toyota Music Factory, home to three stages ranging from the 2,500-seat theater to the 8,000-capacity indoor/outdoor amphitheater. 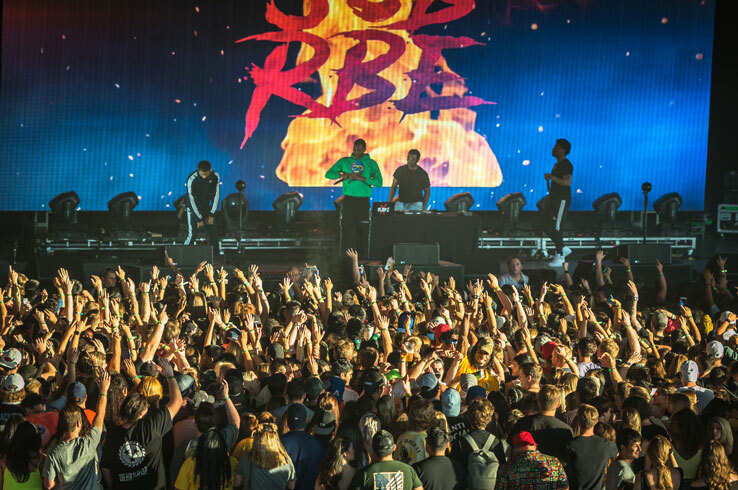 Enjoy the rest of your night out after the show with cuts of fire-roasted steaks at Boi Na Braza Brazilian Steakhouse, mouthwatering sushi at Kabuki Japanese Restaurant, craft cocktails at Bar Louie, and local beers at the Thirsty Lion. These are just a few of the restaurants and bars at Toyota Music Factory that serve up something for everyone. Want even more live music? The Texas Lottery Plaza at the Toyota Music Factory showcases local acts before and after each performance and on Friday and Saturday nights. For a first look at up-and-coming Texas talent, find your way to Bar Louie or the intimate stage at The Ranch at Las Colinas, a chef-driven farm-to-fork restaurant that serves up Texas beef and locally sourced ingredients. These are just a few of the many live music venues you can visit here in Irving. Check out this calendar of upcoming shows so you don’t miss a thing while you’re here. Gliding atop the still waters of an urban canal, the long wooden gondola and its striped-shirt-wearing pilot look like it has been plucked from the waterways of Venice. Yet you don’t have to go to the northeastern coast of Italy to cross this experience off your bucket list. Cruise down Irving’s own Mandalay Canal past slanted terra cotta roofs and in the shadows of stone bridges on one of the gondola tours with Gondola Adventures. 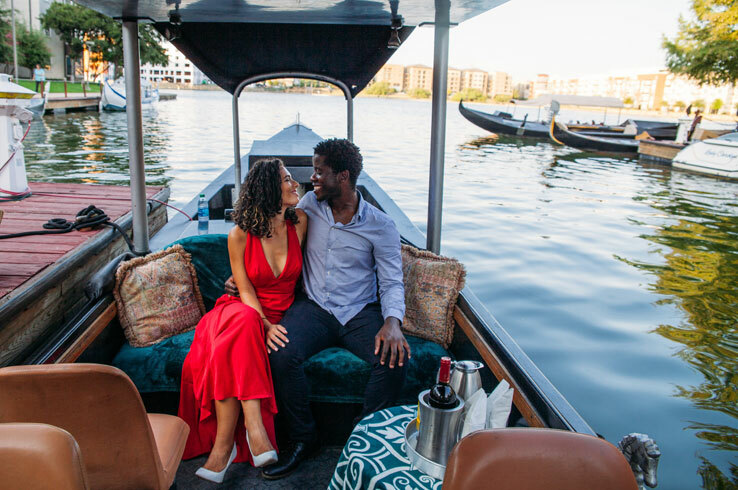 Pick from one of several tours at all times of the day, including an exquisite dinner cruise that features three courses of delicious Italian fare. Of course, there are other ways to get out on the water. Mandalay Canal feeds into Lake Carolyn, which you can explore on a stand-up paddle board or an aqua-cycle. If you’d rather have someone else do the work, opt for the Lake Carolyn Cruise on a covered Lear boat. Book your rentals, or tour, here. Perpetually charging forward across a granite stream, the nine spectacular bronze mustangs are an impressive site indeed. 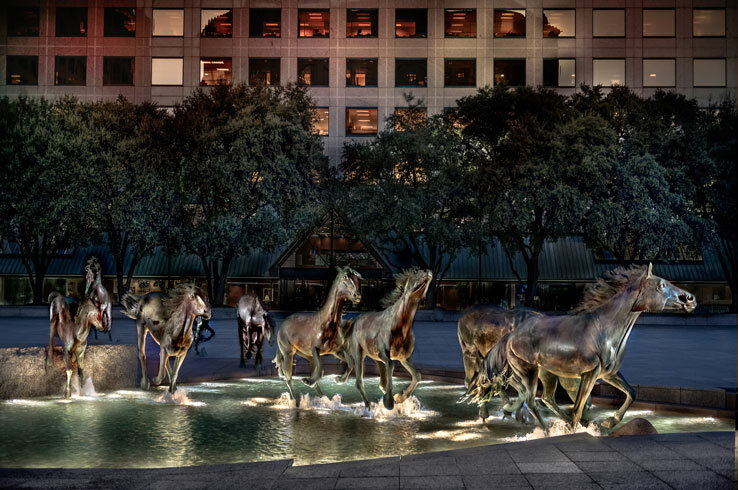 Located in the center of Williams Square, The Mustangs of Las Colinas provide one heck of a photo op. It took African wildlife artist Robert Glen eight years to make this larger-than-life work of art. Snap a few pictures and head inside the Mustangs of Las Colinas Museum, where you can learn about how Glen created the Mustangs and see some of his other works. Williams Square sits near many shops and restaurants in Las Colinas, making it an essential (and convenient) stop during your weekend in Irving. *Note: The Mustangs of Las Colinas Museum will be closed late December for renovations, but you can still visit the sculpture. Piping hot empanadas stuffed with sausage, potatoes, peppers, and onions. Flavorful lamb saag seasoned with cumin and other herbs and spices. Rolls of savory shrimp, salmon, and yellowtail sushi. Dining in Irving is like embarking on an all-day, globe-trotting tasting tour. Start with breakfast at Argentina Bakery, purveyors of hearty espressos, puff pastries, and sandwiches. Then dig into a bowl of kapoon, a traditional Laotian soup with noodles and spiced with cilantro and hot chilis, at Sapp Sapp Lao & Thai Kitchen in downtown Irving. 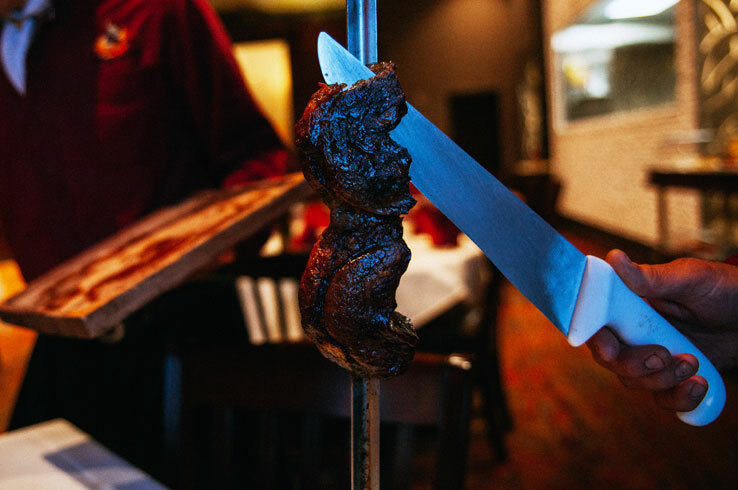 Top it off with an upscale dinner at Boi Na Braza Brazilian Steakhouse, an authentic churrascaria where roasted steaks and cuts of chicken, lamb and pork seasoned with sea salt are cut right onto your plate. Savor it all with something from the impressive selection of fine red and white wines. With restaurants from just about every continent, you’ll never run out of new things to try in Irving. 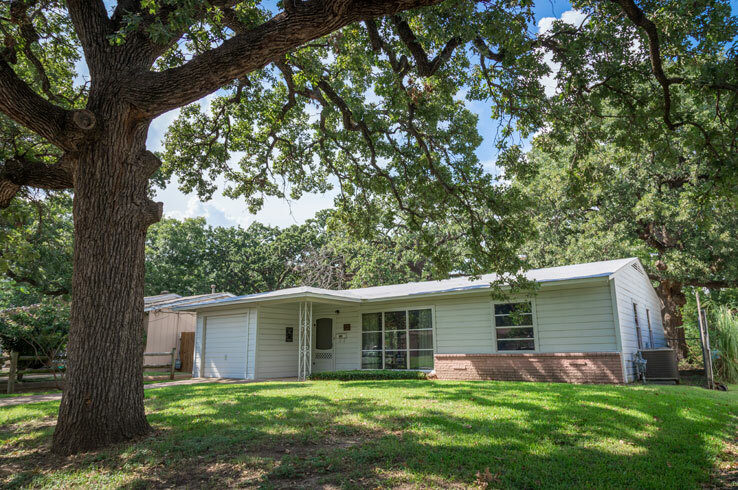 Nestled within an unassuming neighborhood in Irving, the Ruth Paine House Museum owns a footnote in American history far greater than you’d think at first glance. It was here that on Nov. 21, 1963, Lee Harvey Oswald spent the night before allegedly assassinating President John F. Kennedy. Today, the museum is a step back into the early 1960’s. Vintage furnishings and appliances preserve the house as it looked during this critical moment in history, while actors play the roles of Ruth and Michael Paine and Marina and Lee Harvey Oswald. The only way you can visit the museum is to reserve your spot on a tour, so make sure to do so before you stop by. The museum sits near the Irving Heritage District, home to the 1912 Heritage House Museum and a historic train depot in Heritage Park. Cap off your exploration of the district at the Big State Fountain Grill, an old-fashioned diner that serves burgers, sandwiches, and handmade milkshakes. While Irving has more than enough to keep you busy for the weekend, it’s also a stellar starting point to experiencing all that the Dallas-Fort Worth Area has to offer. Stay here and you’ll be just minutes away from such top attractions as the George Bush Library, Perot Museum of Science, The Dallas World Aquarium, Reunion Tower, and the American Airlines Center in Dallas. Cruise on down to Arlington for high-flying fun at Six Flags Hurricane Harbor and Six Flags Over Texas, or head 30 miles west to explore the famous Fort Worth Stockyards. There’s a lot to see and do in the Dallas-Fort Worth Area, and Irving puts you right in the middle of it all. A first-rate live music scene, delicious cuisines from around the world, and an abundance of one-of-a-kind experiences make Irving an awesome place to get away for the weekend. Start planning your trip here.